We’re proud of our permaculture potatoes! On our very first blog entry was a picture with our permaculture potato patch in the background, with the promise that we'd tell you more it soon. However, it wasn't until our blog of 28th July that we finally got round to explaining what we were up to. And what we said was that we didn't really know! The idea is to mulch an area of ground with sheets of corrugated cardboard, cover that with a layer of compost, then lay the seed potato directly on the compost, after prodding a hole through the cardboard below each potato to allow the roots to descend and cultivate the soil (saving digging and preparing the ground for a vegetable patch to follow). The whole lot is then covered in straw. (See pp194-196 of Patrick Whitefield’s The Earth Care Manual: A Permaculture Handbook for Britain and other Temperate Climates for a fuller explanation). Neither of us had ever grown potatoes before and didn’t really know what to expect from our experiment and what signs might herald the harvest. Our free-range chickens had taken an increasing interest in eating the leaves and the slugs seemed to have returned in force so the plants were suffering. We were meant to spray the foliage with seaweed extract but that just stayed on the list of things to do, so the other day Gabrielle suggested that we rummage through the straw to see what was happening. The last time we did this, we only found the seed potato (!) but this time we were elated to find lots of healthy tubers, about 3 1/2kgs (8lbs) of them: not enough to make us self-sufficient in carbohydrates but certainly a few meals worth, experience for next year’s planting and a lovely feeling of satisfaction. 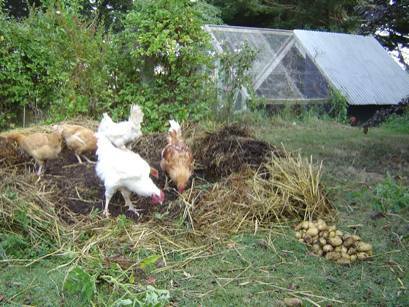 Photo shows our permaculture chickens coming in after the harvest to eat any bugs they can find. Hello Stuart and Gabrielle! Greeting from middle Georgia, USA. Someone was asking me to do a post about growing potatoes, and in my research I found your site. Very much like mine - we read and follow the same people, and grow things the same way! Permaculture, go figure, best thing to ever happen to me. I've thought for a long time that potatoes were the best way to prepare a site for vegetable gardening, and that's precisely what you guys are doing! I moved here from the northwest this past spring, and got here too late to grow potatoes, bummer!, but you can bet we'll have a load next season, like we had last year in Washington. Unless you object, I'll probably drop a link to this article in my post. Thanks for your great work and I'll be back to check in on you guys later. 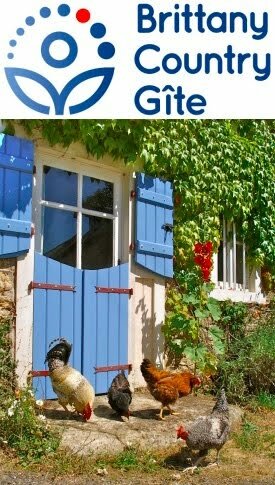 Coincidentally, I've just translated an article in a French organic gardening magazine on growing potatoes under various mulches into English, for future publication in Permaculture Magazine. Best luck next season and please feel free to add a link to your own blog.